Gentle rounded shapes for a relaxed and elegant look! The Sunrise woolen rug is notable for its Japanese-inspired design where circular shapes of different sizes are combined with colors that are juxtaposed with one another. A rectangular woolen rug of the finest quality on a 100% cotton base. Hand-made using the ""Hand Tufting"" technique and natural dyes, it is ideal for the living room, dining room, bedroom and also for children's rooms. 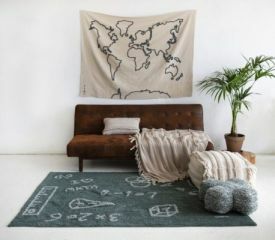 A woolen rug is more rigid and thicker than a cotton rug and is gaining ground in the international trends of decoration.